Dieses Mal war das Element "Feuer" dran. Dies sind die ATCs, die ich zu dem Thema gemacht und nach Neuseeland zum Tausch geschickt habe. This time the ATC subject has been the element "fire". Here are the cards I made and sent to New Zealand for swapping. Nun fahr ich erst einmal für ein paar Tage nach Amsterdam! Bis bald! Now I am off for Amsterdam for a few days! See you soon! Im Moment arbeite ich an diesem "etwas anderen" LogCabin Quilt nach einem Entwurf von Valerija Mezhybovska. Die Blöcke werden auf Papier genäht und anschließend mit der Englischen Papiermethode von Hand zusammengesetzt. Right now I am sewing this "slightly different" LogCabin quilt after a pattern from Valerija Mezhybovska. The blocks are foundation paper pieced and sewn together by hand with the English paper piecing method. Amy (Park City Girl) is once again organizing the Blogger’s Quilt Festival over at Amy’s Creative Side. Every blogger is encouraged to show one of their favorite quilts and link to the event. Last year hubby and I went on a wonderful trip to Cambodia and Malaysia (well, the kids are grown now and once again we were travelling just the two of us like we did when we were young...). In Malaysia I bought some of these typical batik sarongs and back home I made a quilt out of them. The color combination is quite different from what I usually work with but I love this quilt as it holds a lot of lovely memories of a likewise country. Ich mach jetzt definitiv bei Veris Mystery mit - und zwar mit diesen Fassett-Stoffen. In Woche 1 gab's nun genaue Angaben zum Stoffverbrauch und so hab ich noch ein paar Stöffchen bestellt, aber auf die werd ich wohl noch ein paar Tage warten müssen. Nächste Woche geht's ans Schneiden und in Woche 3 wird genäht. Ich freu mich, dass ich ein schönes Nachfolge-Projekt für den QZ Fassett-Mystery gefunden habe! I am definitely participating in Veri's Mystery and I picked these Fassett fabrics. In week 1 we got instructions for selecting fabrics and I ordered some more. Next week we will get cutting instructions and then we will start sewing in week 3. I am happy to have found another great project after that last miserable Fasset Mystery! Nachdem die Wogen den KF Mystery Misery betreffend im entsprechenden Forum mal wieder ziemlich hoch geschwappt sind, wurde von der Quiltzauberei kulanterweise das Angebot gemacht, aus dem Projekt aussteigen zu können. Da hab ich nicht lange überlegt und das bisher erhaltene Material wieder zurückgeschickt. Ich werde jetzt auf eigene Faust einen Fassett nähen oder mal schauen, ob das hier vielleicht etwas für mich ist. The store finally offered to back out of the KF Mystery Misery, which I did without contemplating. I decided to sew a Fassett on my own now or I'll have a look at this one. Der mit Spannung erwartete 5. Teil des Kaffe Fassett Mystery ist inzwischen eingetroffen. Immerhin gab's diesmal wieder Stoff -"immerhin" ein knappes FQ in Unifarben ;-) Und Ärger gab's natürlich auch wieder, denn diese Stoffe sollen zusammen mit den bisher erhaltenen Streifen nun zu Blöcken zusammengenäht werden, jedoch ist bei Einigen das Grün nicht identisch mit dem Unigrün der Streifen. Offensichtlich wurden die Stoffe von verschiedenen Ballen aus unterschiedlichen Farbpartien geschnitten. Kommentar der Quiltzauberei: das kann man nicht ändern! Unglaublich, aber wahr! Bei mir ist der Unterschied in den Farbtönen zwar sichtbar, aber nicht so krass, dass ich beschlossen habe, nicht zu trennen, sondern so weiterzumachen. The eagerly anticipated 5th part of the Kaffe Fassett Mystery has arrived. At least they included some fabric this time - almost a FQ of single-colored fabrics! !^^ Of course there's been hassle again because one color doesn't match with the stripes they sent before. Obviously they are cut from bales of different dye lots. Anyway mine do differ, but not too much, so that I decides to go on with the project and not to unsew and replace the stripes. 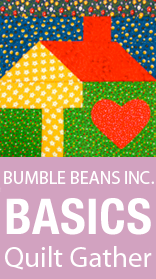 Victoria at Bumble Beans is hosting a huge charity project aiming to help to provide homes and basic support for homeless families. If you are interested in helping you'll find all necessary information over at her blog she especially has set up for this charity project.